APHC chairman Mirwaiz Umar Farooq defied his house detention at his Nigeen residence on the call of Joint Resistance Leadership (JRL) to stage a peaceful sit-in at Lal Chowk, but was detained and lodged in police station Nigeen by the heavy contingent of policemen who were already deployed outside, a APHC statement issued said.Mirwaiz while talking to media men, before his detention, said the government once again followed its practice of using military might, turned entire Srinagar into a military garrison by imposing stringent curb in majority of downtown and sealing the Lal Chowk, to prevent resistance leadership from reaching there to stage a peaceful protest.He said the main motive of today’s peaceful protest at Lal Chowk was to convey to the Prime Minister of India, Narendera Modi that people of Kashmir have been facing ultimate form of repression at the hands of lakhs of government forces present here and New Delhi was directly responsible for the Kashmir situation as it continues to use military might in crushing the genuine voice and aspirations of peace loving people of Kashmir. 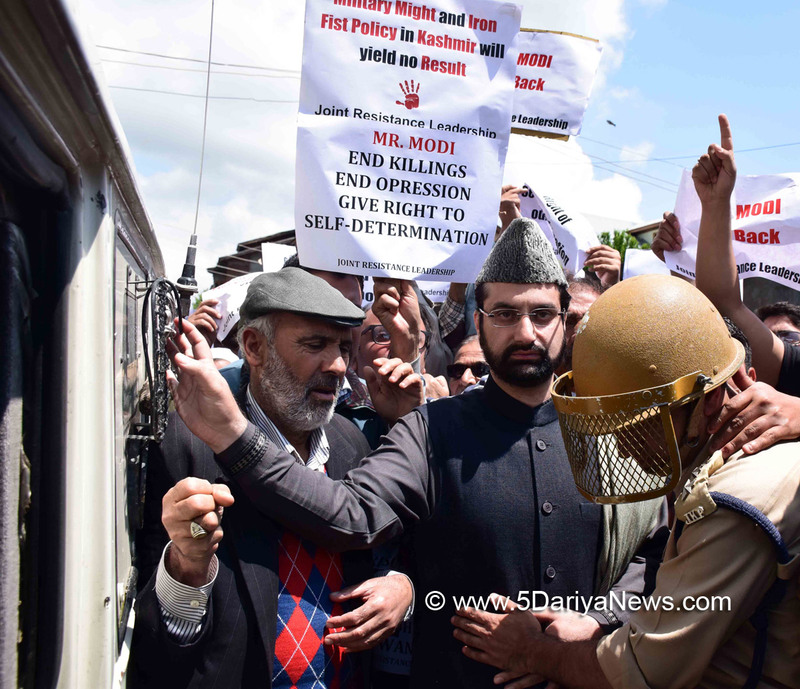 Miwaiz said that leadership and people wanted to convey to Modi the “Mann ki Baat” of every Kashmiri that for the past seven decades they are waiting for the resolution of the Kashmir dispute. They wanted to convey that Kashmir issue could not be addressed through economic packages from New Delhi. Kashmir issue was not a law and order issue or an issue related to basic facilities of roads, water.Mirwaiz said that if GoI believes that Kashmir issue can be resolved through its military might, then it is grossly mistaken as Kashmir being a purely humanitarian and political issue can only be resolved politically as per the aspirations of its people. Mirwaiz stressed that Kashmir issue was not about inaugurating Tunnels and Trains or announcing economic packages in the name of development as such things have been done since 1947, but these measures couldn’t change or alter the basic nature of the Kashmir dispute.Mirwaiz said that people of Kashmir have been offering priceless sacrifices since past seven decades not for the announcement of economic packages of inauguration of roads and tunnels but solely for the resolution of Kashmir issue.He asked how long will Kashmiri people be selectively killed?